1. Refactoring, a First Example. The First Step in Refactoring. Decomposing and Redistributing the Statement Method. Replacing the Conditional Logic on Price Code with Polymorphism. What Do I Tell My Manager? Where Did Refactoring Come From? 3. Bad Smells in Code. The Value of Self-testing Code. 5. Toward a Catalog of Refactorings. How Mature Are These Refactorings? Replace Method with Method Object. 7. Moving Features Between Objects. Replace Data Value with Object. Change Unidirectional Association to Bidirectional. Change Bidirectional Association to Unidirectional. Replace Magic Number with Symbolic Constant. Replace Record with Data Class. Replace Type Code with Subclasses. Replace Type Code with State/Strategy. Replace Nested Conditional with Guard Clauses. 10. Making Method Calls Simpler. Replace Parameter with Explicit Methods. Replace Constructor with Factory Method. Replace Error Code with Exception. Convert Procedural Design to Objects. 13. Refactoring, Reuse, and Reality. Why Are Developers Reluctant to Refactor Their Programs? Resources and References for Refactoring. Implications Regarding Software Reuse and Technology Transfer. Technical Criteria for a Refactoring Tool. Practical Criteria for a Refactoring Tool. Martin Fowler is the Chief Scientist of ThoughtWorks, an enterprise-application development and delivery company. He's been applying object-oriented techniques to enterprise software development for over a decade. He is notorious for his work on patterns, the UML, refactoring, and agile methods. Martin lives in Melrose, Massachusetts, with his wife, Cindy, and a very strange cat. His homepage is http://martinfowler.com. 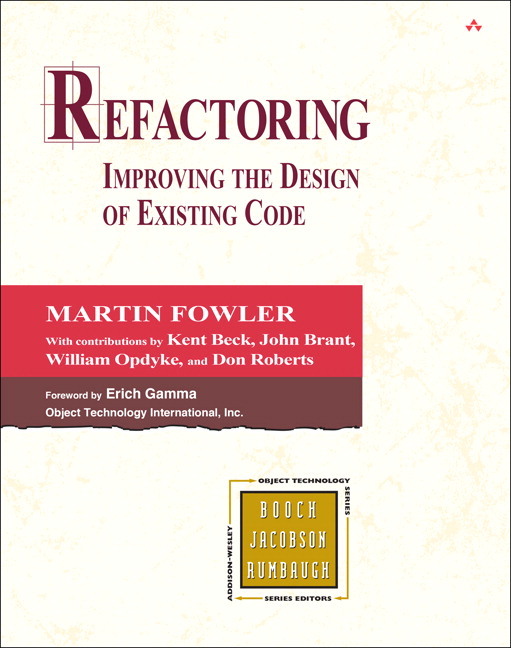 John Brant and Don Roberts are the authors of the Refactoring Browser for Smalltalk, which is found at http://st-www.cs.uiuc.edu/~brant/RefactoringBrowser/. They are also consultants who have studied both the practical and theoretical aspects of refactoring for six years.